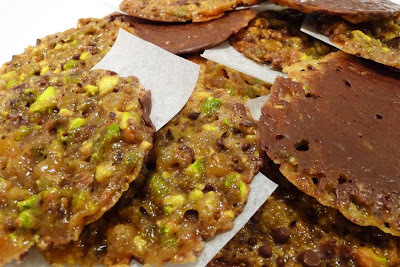 After my first go at making florentines, I had the idea that pistachios, lemon and chili would be a good combo for my next batch. I totally love chili chocolate so I guess that may be where I got the idea from. Again based on the recipe I found at Channel 4, I altered it here and there by substituting the almonds for pistachios and lightly toasting them before slightly crushing them. I added a nip of crushed chili flakes to the caramel mixture - a quarter of a teaspoon for now but I would be a little (LITTLE!) heavier handed next time. These were slightly chewier than I made before and don't think they were as successful in texture but they were better in flavour, so I think its about upping the amount of nuts as there was too much of the sugar mixture. I substituted the flaked almonds for 50g of shelled pistachios, lightly toasting and crushing them but I would use about 60-70g next time. I used 80g of candied orange and lemon peel in total, omitting the glace cherries. The chocolate was dark. I like the Green & Blacks cooking chocolate. If and when I redo these I shall post up the results with the changes but I may have a new thing I want to try at that point! It is such a bad trait I have - florentines one minute, sorbet tomorrow and homemade ricotta the next! I should master one thing before moving on in the kitchen really.